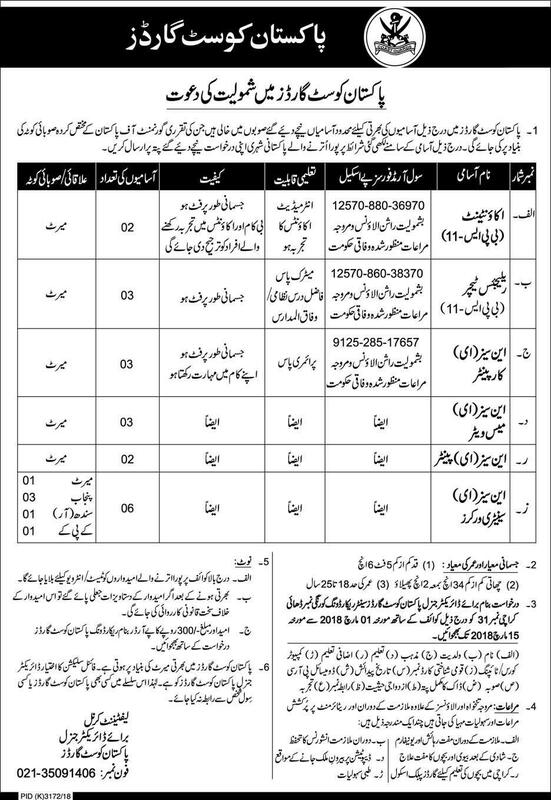 Join Pakistan Coast Guard has announced 19 New Jobs in Daily Jang Newspaper 26 February 2018. Candidates fulfilling the required Criteria may apply for Pakistan Coast Guard Jobs 2018 against Following Jobs Titles Accountant 02 Posts, Religious Teacher 03 Posts, Carpenter 03 Posts, Mess Waiter 03 Posts, Painter 02 Posts and Sanitary Worker 06 Posts. Desired applicants can send their application form to the office of Director General Pakistan Coast Guard Korangi Number Dhai Karachi Number 31 before Given Date and time.